She said while munching on purple cauliflower dipped in non-fat yogurt cheese instead of an everything bagel with real cream cheese. Picture’s worth a thousand words… Sigh.Some days I feel like this. Sometimes I don’t. I feel better since I’ve been doing more an Intuitive Eating approach and I have more options. This said after I’ve recently gained 20 lbs back myself, after losing 50. That’s depressing! But it’s not always true, right? I think as I have lost/gained/lost (currently losing 17 pounds I regained), I have found this out: Fat Me agrees with your chart. She wants oreos and donuts and ice cream. She finds a lot of happiness in the chip bag. And when I am eating badly, I want more of the same, and I do not want to come within 10 feet of a vegetable. So I guess the key is (at least for me… maybe for others) to get away from the junk completely and start finding healthy alternatives that you truly enjoy. For me, there is nothing as delicious as a bowl of freshly made butternut squash soup with whole grain crackers on a cool fall day. Where is “happiness with my LIFE”? for me it’s all the food as fuel mindset. which, in all reality, is PRECISELY YOUR POST. I second the Intuitive Eating approach in theory. The idea that eating for pleasure is OK. No way am I fully there yet but I am trying to listen to my body (and my mind) so I can eat what’s yummy and also makes me feel good (and satisfied) most of the time. I guess the ideal time to work on intuitive eating isn’t when you are restricting calories but why not? Knowing you’re going to be hungry sometimes but you’re just gonna shine it on for now – that’s how it works, right? I imagine Maintenance to be a place in which I come into my own as an Eater. But maybe 1800 calories only looks so good relative to 1300, you know? Sometimes when I am really enjoying a salad or something I wonder if 1. I’m deluded and/or insane 2. Just freaking starving or 3. People will find out I like salad and storm my apartment with torches and pitchforks. Good thing this post is anonymous because I’m going to say it: Most of the time, I love the food I eat. Losing the weight was the easy part. Learning to live with yourself and your decisions is not so easy. That is so unbelievably true. Heartbreaking, but true. Wait, am I looking at that wrong? The happier you are with your weight the happier you are with your food? Is that right? So when you are happily eating healthy, you’re weight is happy too? I think I’m thinking too hard about this now. Because when I am happy with my food I am eating healthy – tasty nonjunk. But when I am eating a lot of crap, then I am not happy and my weight is not of the happy variety either. Oh crap, I think I’ve given myself a headache. BTW, did your headache ever go away PQ? Completely rambly today – sorry!! 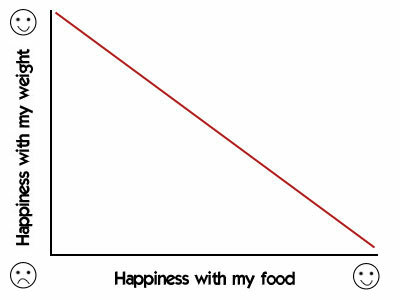 @PastaQueen – Oh, you are killing me (in a good way) with your graphs and math-speak! I totally love it! Is this most of the time, or are you just having a “down day” or “week”? @MizFit – the food as fuel theory does not work for me, because it rapidly turns into “I’m really tired today so I NEED this chocolate brownie”. Of course I’m less tired when I don’t lurch from sugar high to sugar crash, but this reasoning doesn’t work so well when I’m mid-crash. I do enjoy healthy food. And unhealthy food. I’m not very discerning, so I enjoy eating most things. But after a week of eating pub food on holiday recently, I was definitely ready to go back to “small protein item, lots and lots of veggies” which is the usual pattern at home. These things go in cycles. That used to be my problem with every diet . . . until I flipped things from self-control to self-care. And learned to make the healthy foods tasty by putting more effort (and spices!) into them. When I am in a good place eating-wise, I generally am good at thinking about how the foods I am eating are feeding my body. I’ve been off my healthy eating plan for the last month because I just had gallbladder surgery, and wasn’t able to eat any fat prior to surgery and still have some restrictions as I heal. I think to reinspire myself, I need to reread You On A Diet and The Spectrum – neither are diet plans, but offer inspiration in the best ways to feul and take care of your body. Hey Pasta Queen — I discovered a really yummy version of Mac and Cheese that is somewhat lighter but not gross. Just google Ellie Krieger and Mac and Cheese. She uses pureed squash in it which sounds like it might be disgusting, but is not! I am obsessed with it and loving it. @Healthy Amelia – I have a recipe like this on my blog (Escape from Obesity)… the link is on the sidebar, Butternut Mac & Cheese. I use whole grain pasta, skim milk, and butternut squash in it. Even if I was not trying to lose weight, this would be the recipe I make because it is SO GOOD!! I’m not saying anything everyone doesn’t already know, but the key is moderation. You can be happy with your food as long as you have the self control to only have a few sips of a cookie dough shake and then throw it away. There are so many books you can pick from for this, but seriously, “Why French Women Don’t Get Fat” changed my attitude toward food entirely and it came right at a time when I’d lost 30 pounds and probably would have started gaining it back if it hadn’t been for that book. It was so hard for me to learn to let myself have a treat now and then and not think, “hey, I’ve messed up, now I can eat everything in the fridge and the paint off the walls.” I turned it into a game with myself: “I’ve NEVER had just one bite of caramel corn and then put it away. Let’s see if I can do it.” And now, on my better days, I can. I still can’t keep it in the house, but if I’m staying with someone for a few days and they have it, I don’t need them to throw it away. And that for me is a HUGE improvement. If you are becoming too dissatisfied with your food, perhaps you need to switch eating plans. You may like Prevention’s Flat Belly diet, which consists of four small meals, each containing a serving of monounsaturated fat (including dark chocolate), or another plan that is healthy and tasty. Or perhaps just switch your focus from losing weight to losing a size and try to get there with exercise and a moderate diet. A third option would be trying to maintain where you are now until the headache problem is solved. 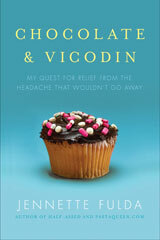 (stress=cortisol imbalance=weight gain has been reported) Good luck! @PastaQueen – I agree with Jill, and no it’s not that I don’t know how to read and need smily faces (nice try, though). Being happy with food makes you happy with your weight?!? Is that because being happy with your weight is a sign of general happiness, or being happy with your weight means you let yourself eat yummy treats until it catches up with you? I’m thinking out loud here. Maybe instead of a direct correlation its one of those grids that has a high and low. It looks like a big plus sign and the goal is to be in the top right box that indicates high on both axis – what are the grids called? So the goal is to be happy with your weight and food. So you learn to appreciate carrots and low-fat ranch because it helps you fit into the miniskirt, but also knowing that eating 23 chocolate chip cookies is high on the food happy scale but low on the weight side. 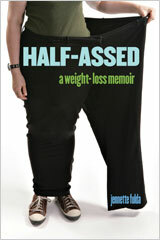 So really all boils down to attitude and learning how to change our mindset about food and its consequences. Ok, now I’m just rambling so I’m going to go. For me it’s more “Being Happy = Better Eating = Weight Loss.” Is that an equation?! Oh, but have you ever had this happen? Try eating a food that you used to have around the house as a staple pre-your new healthy, oh my gosh, I’m doing it, lifestyle–and you can’t stand it! We just had some hot dogs that I used to buy all the time before I embarked on this crazy new life! They’re old fashioned, made by our butcher, and in my memory used to be fantastic. Urgh!! GREASY, to say the least and ew, my stomach doesn’t feel too good! Hang in there. I think there are great recipes out there, it just takes work. Wow, this is actually kind of sad, LOL! I’ve just finished slogging through all the archives (and it took A WHILE) … and then I had a moment of triumph. I’m finished! I’m all caught up! Followed by a moment of near-devastation. I’m FINISHED. I’m all CAUGHT UP. And now I am just like the other lackeys who have to wait and wait for new posts. @RG – You’re reading it incorrectly. It’s showing that the happier PQ is with her food, the unhappier she is with her weight e.g. eating full-fat ice cream means gain weight. @Susan – Thanks, that occurred to me after I left, that I was reading what she wrote, not what she meant: it’s an inverse correlation, not a direct correlation. For me, it’s all about sustainability. Life without the occasional gelato or stack of pancakes is not my idea of a good ride. But I also need to enjoy my food on a daily basis, so I’m working hard to find healthy things that I like to eat regularly. 120 pounds down and counting, and so far it works. But there are always gelato or pancake days in my future!